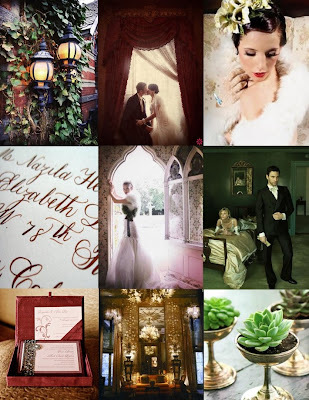 Here's a little photo collage from Elizabeth Ann Designs that is currently serving as the inspiration for the wedding. The theme is Southern Gothic, which might sound scary at first: Flannery O'Connor, prosthetic legs, shabby peacocks and other various elements of the grotesque. However, my idea is to add a lighter touch, to grotesque the grotesque, if you will. Does that sound pretentious? Probably a little. Mostly I needed some sort of label to keep me focused, and Southern Gothic was the one that came closest.